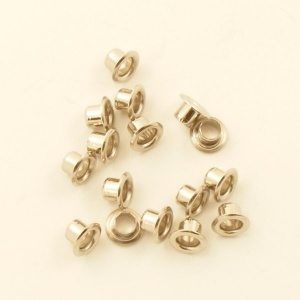 This is a pack of 100 brass eyelets which have been plated with Nickel for a silver finish. They are used to reinforce holes in thin leather. They have an internal diameter of 4mm and the central tube section is 3.5mm deep. 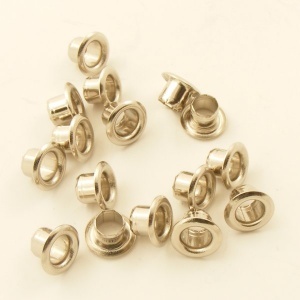 These eyelets are suitable for use on leathers of up to 2mm thick. To fit them, use our small eyelet hammer tool, available here, with full instructions for use.